Sept. 28 — The U.S. Supreme Court may be tinkering with its docket with the expectation that it will be getting a ninth justice by the end of the upcoming term. The court has been operating with only eight justices since Justice Antonin Scalia died unexpectedly in February. That vacancy seems to be prompting the court to put off hearing oral argument in controversial cases until later in the term, which typically goes from October to June, Georgetown University Law Center professor Martin S. Lederman said at a Sept. 19 Georgetown law school event. The justices aren’t eager to hear cases where they might split 4-4, Lederman said. Those cases, including a class action against Microsoft, are conspicuously absent from the court’s scheduled oral arguments. It may be that the court is hoping for a ninth justice to break the tie in those cases, Lederman said. Evenly divided decisions leave in place the decision below without setting binding precedent. The justices badly want to avoid that outcome, Lederman said. Last term, avoiding 4-4 decisions led to narrow holdings and odd vote breakdowns. This term, the court has simply turned away ideologically divisive cases where a 4-4 split is likely, Lederman said. But the court had already agreed to hear some cases likely to end in a split before Scalia passed away. The court hasn’t scheduled for oral argument a handful of such cases, even though they were ready to be argued last term, Lederman said. Cases granted by mid-January are typically argued during that Supreme Court term. But four cases that met that deadline last term were still outstanding at the end of the term, even though there was room to hear them. At least one of those was delayed at the request of one of the parties, Manuel v. City of Joliet, U.S., No. 14-9496, to be argued 10/5/16 . But three others are being held likely due to their divisive topics, Stris & Maher LLP’s Peter K. Stris, Los Angeles, told Bloomberg BNA. For example, on Jan. 15 the court agreed to hear a class action suit against tech-giant Microsoft, Microsoft Corp. v. Baker, U.S., No. 15-457, granted 1/15/16 , Stris, who represents the plaintiffs in that case, said in a Sept. 26 e-mail. “We were ready to argue Microsoft v. Baker last Term,” but it was held over to this term, he said. “Then, along with two other notable cases ( Trinity Lutheran and Murr), it was not placed on either the October or November argument calendars,” Stris said. Each “of those three cases involves historically divisive subjects”— class actions, religious liberty ( Trinity Lutheran Church of Columbia, Inc. v. Pauley, U.S., No. 15-577, cert. granted 1/15/16 ) and the takings clause ( Murr v. Wisconsin, U.S., No. 15-214, cert. granted 1/15/16 ), Stris said. “I suspect the Court is waiting to see what happens with the confirmation process,” he said. 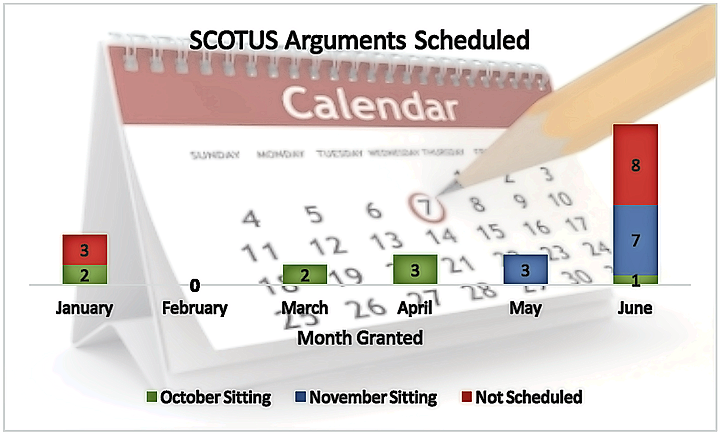 Stris’s hunch explains why other controversial cases haven’t been scheduled for oral argument yet. The court granted a racial gerrymandering dispute and a death penalty case in early June, Bethune-Hill v. Va. State Bd. of Elections, U.S., No. 15-680, cert. granted 6/6/16 , and Moore v. Texas, U.S., No. 15-797, cert. granted 6/6/16 . Neither of those hot-button issues are on the court’s oral argument calendars yet, even though other cases granted later are already set for argument. All told, the court has 11 cases that it’s agreed to hear but hasn’t yet set for oral argument, research conducted by Bloomberg BNA shows. Only two involve relatively non-controversial topics, like patents or bankruptcy. The remainder include an antitrust dispute involving the biggest banks and credit card companies in the U.S., a claim of gender discrimination in immigration statutes, the death penalty and another racial gerrymandering suit. But while Lederman said the court’s scheduling suggests that it might be counting on a ninth justice by the end of the term, another court watcher said that’s unlikely. The Senate has made clear that it won’t hold confirmation hearings on the Supreme Court vacancy during the lame-duck session, Carrie Severino of the Judicial Crisis Network, Washington, said at a Sept. 27 Federalist Society event. There’s not enough time for the next president to take office in late-January, nominate a qualified individual and have the Senate hold confirmation hearings and vote on that nominee before the Supreme Court breaks for the term in late-June, Severino, whose biography says she has briefed Senators on judicial nominations, said. So holding off controversial arguments in the hope of avoiding 4-4 decisions seems like a strange strategy, she said. But Lederman disagreed. No matter who wins the presidency, the president and senate are likely to act on the vacancy quickly, he said. Prior to the most recent nomination, “the average time from nomination to confirmation is 67 days,” according to the White House. “The longest time before confirmation in the past three decades was 99 days, for Justice Thomas, and the last four Justices, spanning two Administrations, were confirmed in an average of 75 days,” its website says. Accordingly, we should see someone in the ninth seat by March or April, Lederman said. Until then, as Lederman put it, court watchers will just have to keep reading the Supreme Court tea leaves.